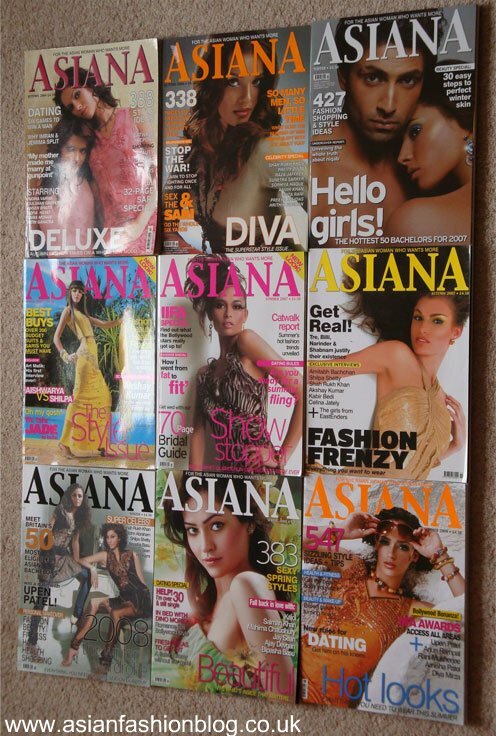 The team at Asiana Magazine have today made the announcement that they will no longer be printing their magazine and instead will be focusing on their online portal Asiana.tv. As part of its on-line development plans, I and I Media has ceased publication of the printed version of Asiana Magazine. 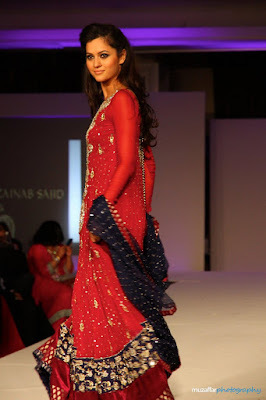 Asiana Wedding magazine will continue to be published quarterly. The printed magazine will be missed by many, but this move will allow the business to focus on its digital future and core wedding market. When the Asiana.tv portal launched back in September 2010, I wouldn't have guessed that just a year later they would be closing down their print version. Interestingly, when I blogged about the launch of asiana.tv and ran a poll asking whether being able to read the magazines online for free would stop people from buying the magazine - 44% of people said they would NOT continue to buy the magazine. I guess this, along with the costs of printing the magazine compared to publishing the same content online was a factor in their decision. Asiana Wedding magazine will continue to be published in print format, so fear not brides-to-be! 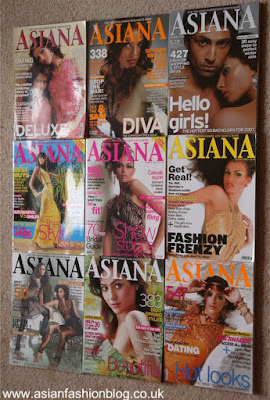 But for non brides and anybody else who reads this magazine for general interest it's sad that Asiana Magazine will no longer be found on the shelves next to all the other women's lifestyle magazines. I hope that this change from print to online hasn't caused any job losses at the company and that any readers who purchased subscriptions are refunded or compensated somehow. The current issue, Autumn 2011 will be the final print issue, so get your hands on a copy while you can! I'm keen to see how the Asiana.tv site grows, the main focus of it at the moment seems to be their video channel or "Asiana Tube" as they've named it and their fashionfinder, aside from that I must say I personally haven't been captivated by any of other content they've published. 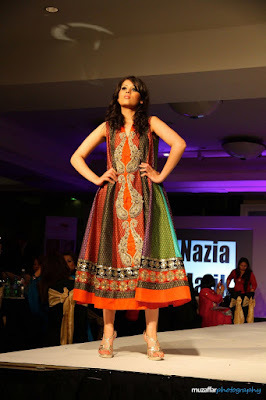 Here's the collection from designer (and Pakistani TV host) Nazia Malik at the 2011 Rhythm of Asia fashion show which took place in Manchester this year. There there was an interesting mix of outfits in this collection with no distinct colour or embroidery theme that I could identify. I'm not such a fan of lace so these two white outfits above didn't inspire me at all, I did however love this black and silver gown below, I'd put this on my wishlist! I thought I'd finish this post on a positive note with two outfits which I did like, a short sleeved pink trouser suit and for a change compared to everything else, a shorter dress worn without trousers or churidar pants. 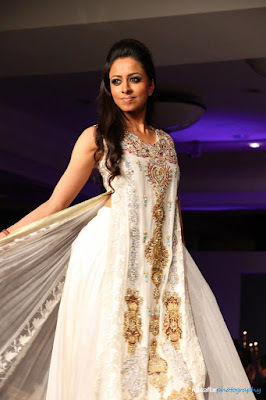 Waseem Noor was another of the designers showcasing his collection at the 2011 Rhythm of Asia Fashion show which took place in Manchester at the end of September. 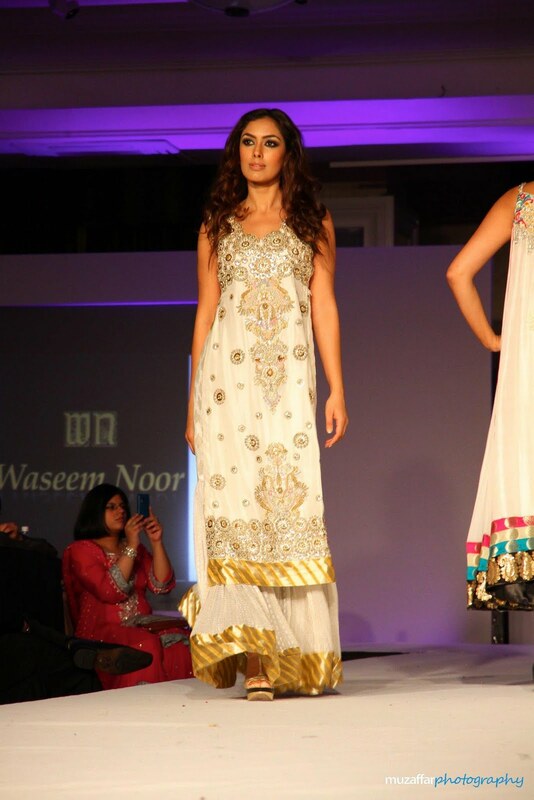 Like a lot of the outfits coming out from Pakistani designers at the moment these were all about long flowing tops. 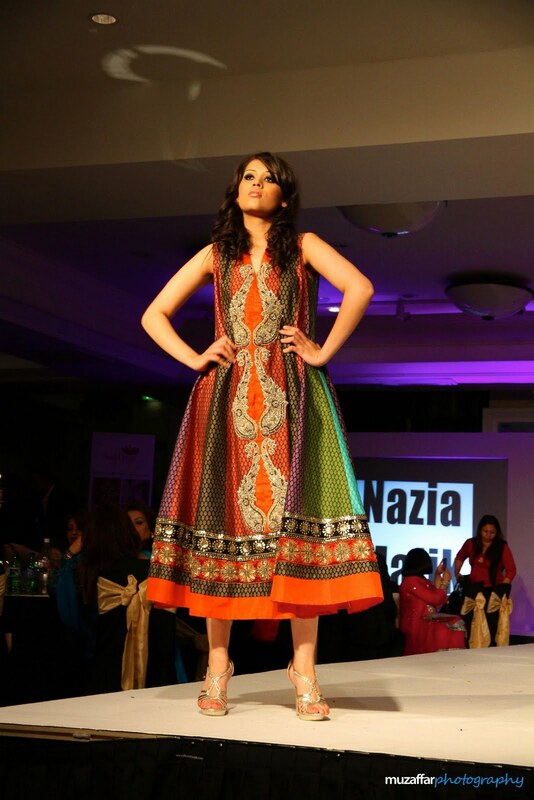 The annual Rhythm of Asia Fashion Show, usually held in London, came to Manchester this year. 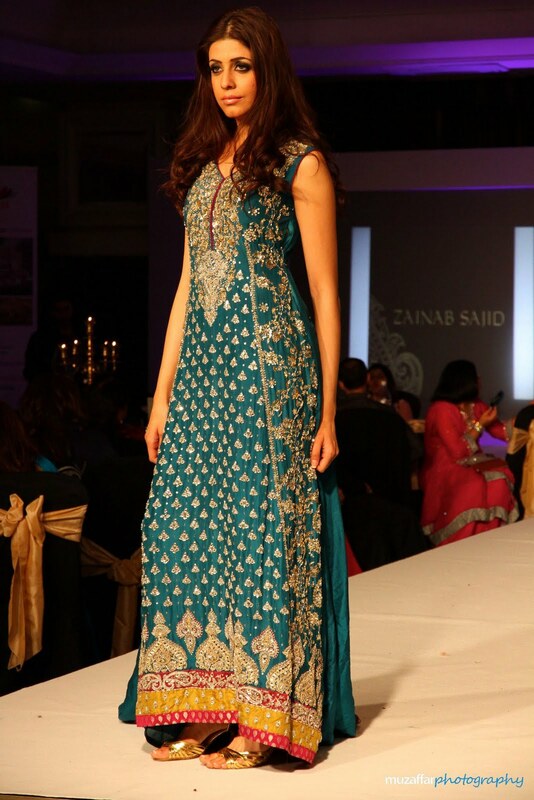 It was just my luck that on the day a big asian fashion show took place in the north west, I ended up being in London at a family wedding! 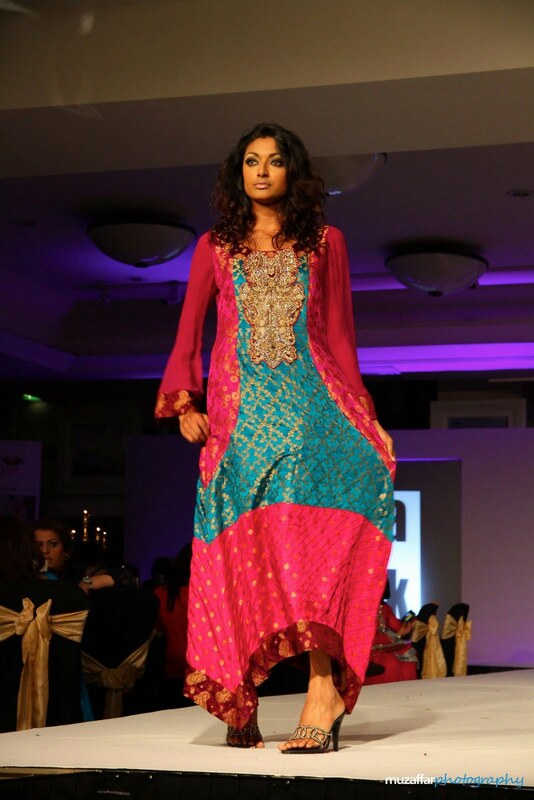 Although I wasn't there in person I've managed to get some photos from the catwalk to share with you all, thanks to Muzaffar Photography. 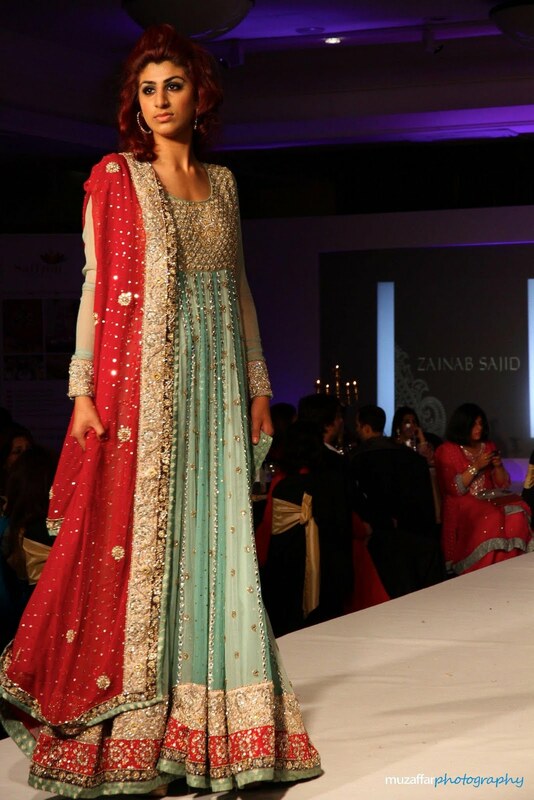 So, first up here's the collection by Pakistani Designer Zainab Sajid. Last month, London's Mint Leaf held host to a fashion show by Indian designers Anjalee and Arjun Kapoor in aid of the charity IIMPACT. The influence behind the collection was a vintage feel and this was reflected in the lace trimmings used, constructed embellished tops and heavily volumised lenghas. 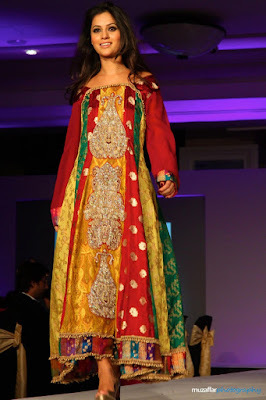 This collection was also showcased recently at the 2011 Aamby Valley Bridal Week in India, you can view photos from that event, including an appearance by Bollywood actress Mallika Sherawat, here: Anjalee and Arjun Kapoor at Aamby Valley Bridal Week 2011. A massive thanks to photographer Nabeel Akhtar and Sam at ThePRProfessionals for these photos.